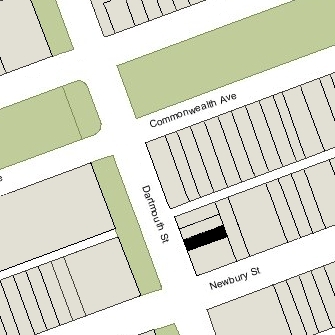 279 Dartmouth is located on the east side of Dartmouth, between Commonwealth and Newbury, with 281 Dartmouth to the north and 277 Dartmouth (147 Newbury) to the south. 279 Dartmouth was built ca. 1871 by builder James M. Standish, one of three contiguous houses (279-281-283 Dartmouth). He and his wife, Sarah (Grant) Standish, lived at 283 Dartmouth and sold the other two houses. Click here for an index to the deeds for 279 Dartmouth. On November 2, 1875, 279 Dartmouth was purchased from James Standish by Harriet Fidelia (Page) Lauriat, the wife of Charles Emelius Lauriat. They previously had lived on Berkeley in the South End. Charles Lauriat was a book dealer and publisher. They continued to live at 279 Dartmouth during the 1882-1883 winter season, but moved thereafter to a new home they had built at 101 Newbury. On June 27, 1883, 279 Dartmouth was purchased from Harriet Lauriat by Dr. Joseph Heber Smith. He and his wife, Mary Amanda (Greene) Smith, made it their home. They previously had lived in Melrose. J. Heber Smith was a homeopathic physician and professor at the Boston University School of Medicine. On March 8, 1892, he transferred the property into his wife’s name. J. Heber Smith died in October of 1898. Mary Smith continued to live at 279 Dartmouth during the 1898-1899 winter season, but moved thereafter. She continued to own 279 Dartmouth and lease it to others. By the 1899-1900 winter season, 279 Dartmouth had been leased from Mrs. Smith by Mrs. Mary (May) Adeline (Bradbury) Estes, former wife of Prince Joseph Estes. Mrs. Estes had lived at 281 Dartmouth from about 1898, where she operated a lodging house. After leasing 279 Dartmouth, she expanded her lodging house to include both buildings. In about 1907, she leased 277 Dartmouth and operated all three buildings as a combination of lodgings and medical offices. Dr. Conrad Smith, the son of Dr. J. Heber and Mary Smith, continued to live at 279 Dartmouth as a lodger. He was a physician and also maintained his medical offices there. In April of 1910, Mary Ella (Ruby) Morrison, the wife of architect William Langley Morrison, purchased 277 Dartmouth. It became the home of her mother, Ann (Kennard) Ruby (the widow of James Ruby), and also the location of Mrs. Morrison’s import and dressmaking shop, Mary Ruby, Inc.
Mary Estes continued to operate her lodging house at 279-281 Dartmouth. On February 23, 1912, Mary Morrison purchased 279 Dartmouth from Mary Smith, by then a resident of Detroit. Mary Estes continued to live (and operate a lodging house) at 281 Dartmouth. Conrad Smith moved to 143 Newbury, where he also moved his office. William and Mary Morrison made 279 Dartmouth their home. They had lived at 11 Commonwealth in 1909. 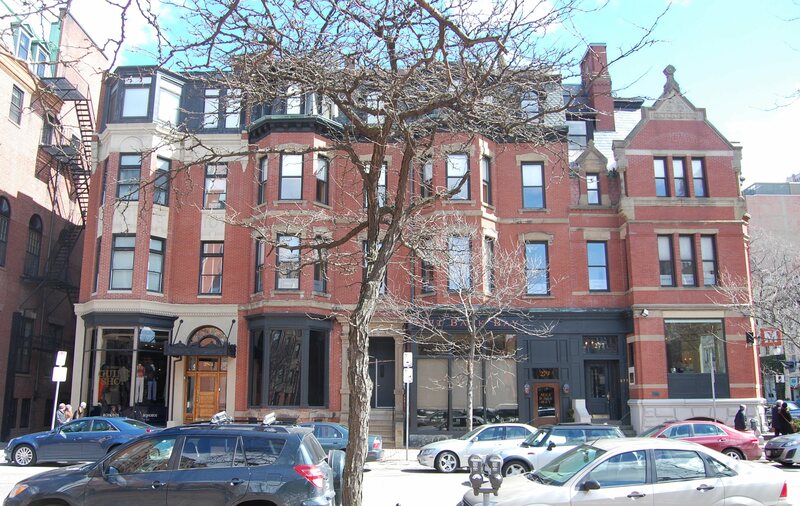 They had moved to 127 Revere in about 1910, and continued to live there in 1911, and then lived at 280 Dartmouth during the 1912-1913 winter season. William Morrison died in April of 1915. Mary Morrison continued to live at 279 Dartmouth. By 1920, her mother, Ann (Kennard) Ruby, and her sister-in-law, Alice Morrison, lived with her. 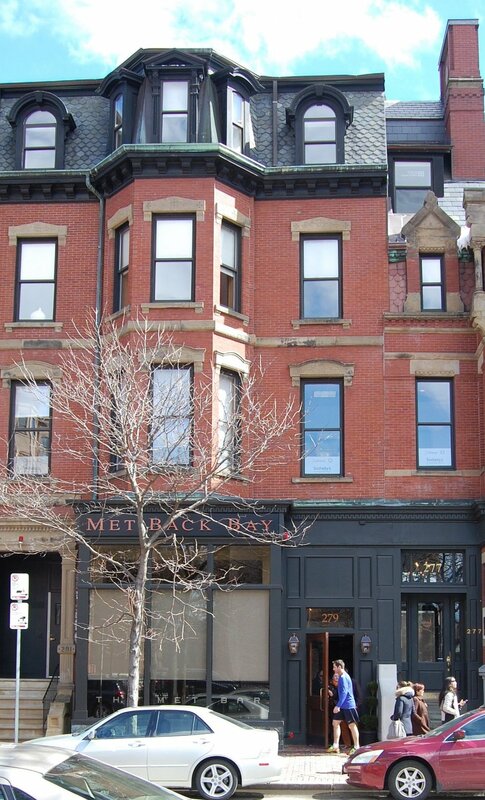 By 1917, the Boston Society for Decorative Arts — a charitable organization that sold needlework and similar items made by needy women — had leased a storefront at 279 Dartmouth and additional rooms at 281 Dartmouth. It applied for (and subsequently received) permission to cut a door between 279 and 281 Dartmouth. The Society continued to be located at 279 Dartmouth in 1920, but was no longer there by 1922. By 1920, 277 and 279 Dartmouth had been combined and converted into a multiple dwelling, with Mary Morrison’s dressmaking shop located at 277 Dartmouth and several apartments with the address of 279 Dartmouth. Mary Morrison continued to live at 279 Dartmouth and operate Mary Ruby, Inc., at 277 Dartmouth. Her mother lived with her until her death in January of 1931. Mary Morrison’s daughter, Mary Langley Morrison, an architect and interior designer, also lived with her. She married in the late 1920s to John E. Kennedy, a broker and later an advertising agency executive. They lived at 97 Mt. Vernon after their marriage, but had joined Mary Morrison at 279 Dartmouth by 1932. By 1934, the Dartmouth Bookstall also was located at 277-279 Dartmouth. Both businesses continued there until about 1946: Mary Ruby, Inc., on the corner in 277 Dartmouth and the Dartmouth Bookstall in a storefront at 279 Dartmouth. Mary Morrison’s daughter, Mary Morrison Kennedy, also operated an interior decorator’s studio at 277 Dartmouth (in the 1940s, she joined the Sheraton Corporation and, according to her June 7, 1989, obituary in the New York Times, “for almost thirty years was in charge of interior design for the 45-hotel chain”). Mary Morrison and the Kennedys continued to live at 279 Dartmouth until about 1941, when they moved to 9 Hereford. On February 11, 1941, 277-279 Dartmouth were acquired from Mary Morrison by the Massachusetts Hospital Life Insurance Company, which acquired the property for the amount of the mortgages it held on the properties. On January 31, 1946, 277-279 Dartmouth were acquired from the Massachusetts Hospital Life Insurance Company by Joseph P. Gallinetti., who opened Joseph’s restaurant at 279 Dartmouth. He and his wife, Olivia Florence (Taves) Gallinetti, lived at 277 Dartmouth and continued to lease space in both buildings to others. Mary Ruby, Inc., and the Dartmouth Bookstall moved across the street, to 284 Dartmouth, and in 1946, 277-279 Dartmouth was being used as the Republican campaign headquarters. Joseph Gallinetti died in June of 1948, and on December 2, 1949, 277-279 Dartmouth were acquired from his estate by Uptown Realty, Inc.
Joseph’s restaurant continued to operate and in the early 1950s expanded into 277 Dartmouth. In about 1956, Joseph’s expanded further into the street level of 281 Dartmouth, which Uptown Realty subsequently acquired in October of 1964. In 1979, Joseph’s was acquired by Charles Sarkis and Jack Sullivan, who renamed it Joe’s American Bar and Grill. On October 31, 1979, 277-279-281 Dartmouth were purchased from Uptown Realty by real estate developer Neil St. John Raymond. The property subsequently changed hands and in April of 1991, the three parcels were combined into one property, with the lower level remaining a restaurant and the upper floors used for offices.